There are many annoying things about possessing small children but one of the worst has to be the terrible potential for ear-worm. But – wait! – before you start leaving in droves, horrified at a food blog discussing parasites, don’t worry, it’s not like ring worm or tape worm but instead is a term for a catchy piece of music that gets stuck in your head. Children’s television is the worst offender when it comes to embarrassing yourself in polite company by singing about Mr Bloom’s compostarium or Rastamouse’s Da Easy Crew. But the most evil ear-worms of all come from the irrepressibly jaunty Tractor Ted; as a result I can’t think about buffaloes without hearing ‘they’re big, black and slow – the buffalo!’ I had to eat this week’s cheese just to stop me hearing it every time I opened the fridge. Pendragon is a hard, pasteurised, buffalo milk cheese made by the Somerset Cheese Company, located, unsurprisingly, in Somerset. The Company was established in 2005 by cheese veteran Philip Rainbow, along with two of his friends, Nicholas and Anita Robinson. Philip had been making cheese for other dairies since the 1960s and at one time Anita had been his assistant. Rather unusually, they produce cheeses from cows, sheep, goats and buffaloes (big, black and strong – the buffalo!). 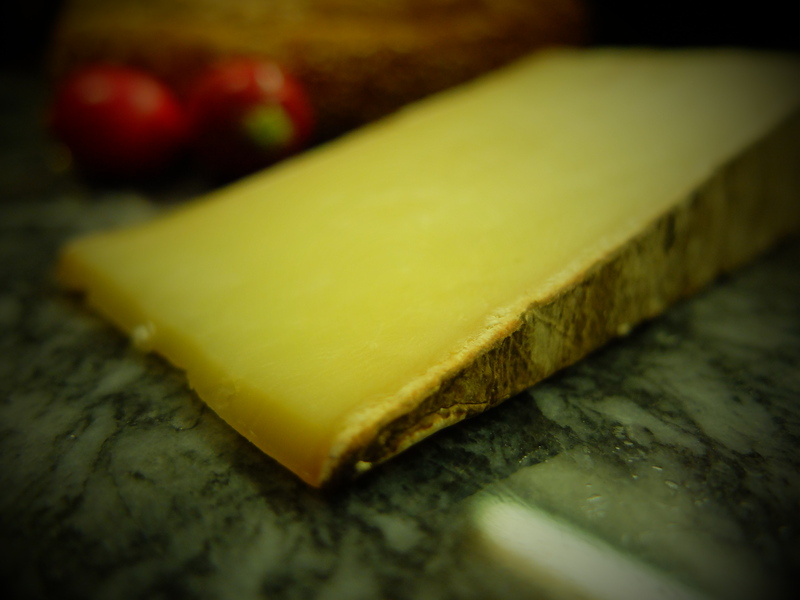 The name Pendragon comes from the Somerset connections with the King Arthur myths (and perhaps also to alliterate nicely with some of his other cheeses, Pennard Ridge and Pennard Vale). Given that they are located in the heart of Cheddar country, it’s no surprise that Pendragon is made in a Cheddar style. The texture is a bit different though, more buttery and mouth-melty. The taste is also not unlike a mellow, mature Cheddar but for the distinctive, slightly sour tang of the buffalo milk. All that I’ve read seems to indicate that buffaloes are not the most placid and amenable of creatures so quite how you milk one is anyone’s guess. But then I’m the person who once got savaged by a bunch of cows and they seem to knuckle down and do the milking parlour business. Fortunately for Philip, he just needs to worry about the cheesy bit and not the buffaloes (altogether now – ‘big, black and slow…’). Additional research from The Cheese Shed, Fosse Way Magazine and Jenny Linford’s Great British Cheeses. Sounds like a tasty cheese. I’m all out of cheese – need to get to a shop, urgently! Ooh, yes, get yourself there quick! Any more eggs today?! There’s been one each day since. Go girls! Sounds good. Our house is filled with renditions of Let it go from Disney’s Frozen, what a great idea that every time she bursts into song I reach for the cheese!! My sister’s kids used to drive me insane with the music from the toys and tv shows when they were bubbies, so I used to get her back by buying the littlies the loudest toys I could find 🙂 Hm, don’t think I’ve had a hard buffalo milk cheese, I will have to find some! Ha! Mine have an evil auntie like you 😉 Zingzillas is this deeply annoying show about singing monkeys and she bought them a guitar that played the tunes WITH NO OFF SWITCH! Pure torture. Do they do buffaloes over there (so to speak)? We have buskers near work that perform a similar role – ear wormy, less jaunty compared to childrens’ shows, I should start cheese therapy too. Not having heard some of these ear worm songs, for one crazy moment I thought of googling…. but sanity saved me! Nononono, please don’t do it, save yourself! Not being the possessor of small children I (happily) don’t know the tune but I fear my head is filled with buffaloes anyway after that. I thank you (sarcastic font). The cheese sounds great though, another one to search out. I think I should just give my local deli a subscription to your blog. I’d love to know what tune you’ve conjured up! Have you got a good deli near you. Keep meaning to seek out Suffolk Gold – have you tried it? Yes, it’s made just up the road from us. They do a good blue cheese too. Lord, I thought you were talking about a UK version of tape worm! I too am suffering from ‘Frozen Let it Go’ ear worm. This cheese sounds wonderful. Looks like a Tassie Pyengana cloth bound matured cheddar we get here, but it’s not made of buffalo milk. Yummy. Mmm, you can’t go wrong with a cloth-bound Cheddar. I imagine some people don’t like the tang of buffalo milk/cheese but I rather like it. Blimey, I’m almost tempted to Google that. I’m rather fond of Postman Pat but Mr Bean makes me want to poke myself in the eyes. What a fabulous introduction! And so so true! Ear-worm – the madness inducing blight of many a stressed patent! “Children’s television is the worst offender.” Thanks, I now have the Thomas the Tank Engine’s theme in my head. It had been dormant for years before reading that line. Not native, no – but there is someone in the middle of Wales who makes buffalo cheese http://www.buffalodairy.co.uk/ ! Well, you’ve got me. What started off as a bit of fun has turned serious; if someone had said Italian or Romanian buffalo, my response would have been the same. I had no idea Mediterranean buffalo existed either… 🙂 Just goes to show, I do learn something everyday. Ha! I tried this cheese a couple of weeks ago at the farmer’s market I visited whilst on my blue cheese hunt. I agree with you about the tangy after-taste. My initial thought was “hmm, tasty” and then it turned to “hmm, not so sure”. Although it was preferable to the blue one I tried. How I wish Philip’s friends had been called Nicholas Gold and Anita Sunshine. Rainbow is such a cool surname . . . !